I'm working to understand how my a6000 works in detail with the aim of (possibly) making my own LED TTL converter. At the moment I use the a6000 with its internal flash to trigger a set of YS-D2 strobes using my optical cables. I either use the strobes in manual or TTL mode. The TTL is reasonable, but not always perfect. 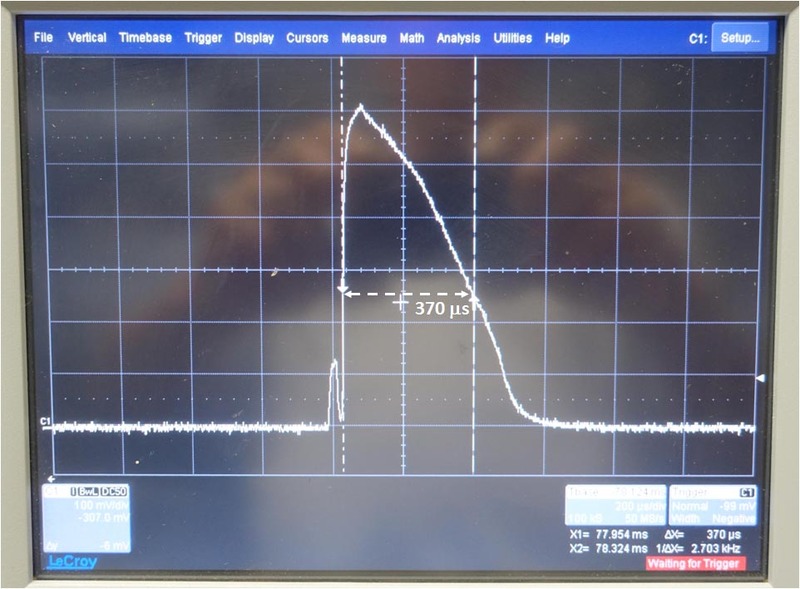 I wanted to understand how the a6000 TTL system works, so I connected a little oscilloscope to my hotshoe x-sync pin and used the other channel of the oscilloscope with a photodiode to monitor the flash. See attached 2 screen grabs for two flash types - Fill Flash, Rear Sync. I also did a rear sync, but it's result was remarkably similar. I wasn't able, in any case, either Manual, Aperture priority or full automatic, to witness any pre-flash whatsoever from the camera's internal flash. Does the a6000 meter TTL during the exposure? Am I missing something here. 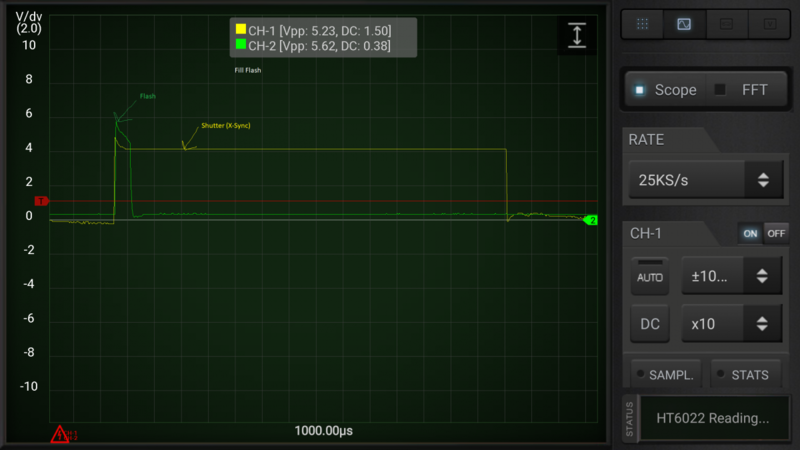 Welcome any insights, comments or suggestions to be able to run another oscilloscope test. I measured the pre-flash from my ST-03 strobe optically triggered from the flash from a Sony RX100iv and found a preflash and main flash separated by 78 milliseconds. Full width half maximum of each light pulse was about 370 microseconds. 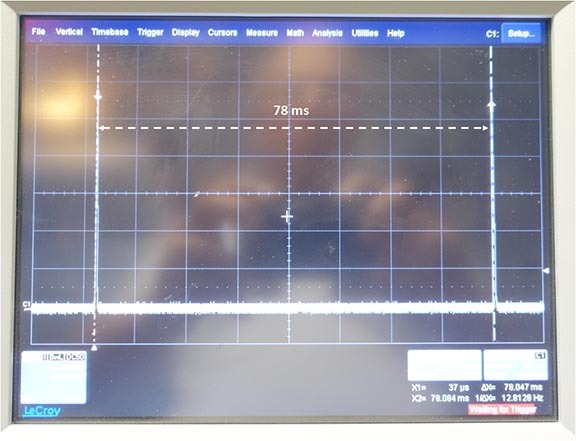 These are light pulses measured with a photodiode, not electrical signals. On the timescale of the inter-flash, each light pulse looks like a spike. What was your scope sweep speed, because if it was fast enough to resolve the pulse, then the second pulse would be off the screen. Edited by davec13o2, 24 July 2018 - 03:16 PM. It might be that the camera detects something attached to the hotshoe but because it can't communicate with it switches to manual flash? You could test this out by changing ISO and see if the pulse width changes for the flash. The fact that rear sync does not change position is with respect to the x sync pulse is a little suspicious as it should start the pulse a little later in the sequence, depending on the shutter speed the camera is set to. At slow shutter speed the pulse is much later, at maximum sync speed not much difference in timing. Edited by ChrisRoss, 24 July 2018 - 04:25 PM.